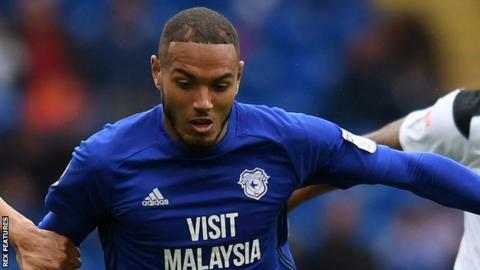 Cardiff City manager Neil Warnock is hopeful striker Kenneth Zohore will return from injury in time for Saturday's home match against Millwall. Zohore, 23, missed the 1-0 Championship win at Middlesbrough on Saturday with an ankle injury. The Dane has scored three goals in 12 league appearances this season. "Ken's not as bad as it sounds so, as long as he's not in pain, he should be able to start training on Thursday," said Warnock. "Him and [midfielder Aron] Gunnarsson were both last-minute jobs. They both failed fitness tests but they should both be available next week." Joe Ralls' penalty earned second-placed Cardiff their narrow victory over Middlesbrough at The Riverside. The Bluebirds now face two successive home league matches, with Millwall visiting on Saturday and Ipswich the opponents on Tuesday, 31 October.